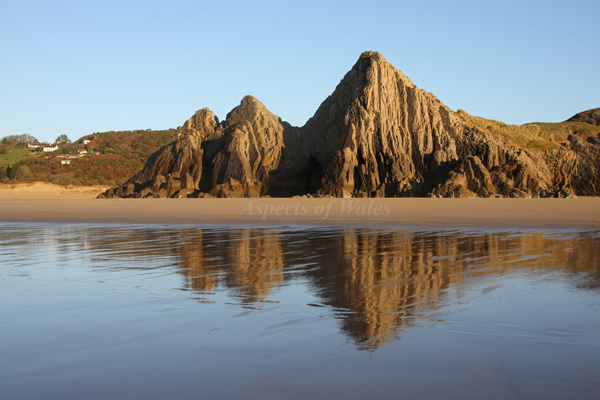 Taken soon after sunrise in November 2011 at NGR SS4108688051, looking back towards the famous three cliffs from the shoreline. The tide was nearly fully out and the sun had just emerged from behind Shire Combe, which it only does at sunrise in the late autumn and winter months. This is one of the very few occasions when I've managed to take the exact photo that I was hoping for. Canon EOS 40D, Canon EF-S 17-85mm lens at 30mm, Manfrotto tripod. Exposure F11 at 1/60 sec. Original image in Raw format.